The unmaking of Batman continues, though it has echoes of the 1980 miniseries, The Untold Legend of the Batman. In that series, Batman suffers multiple attacks from an unknown quarter using intimate knowledge of all his secrets to strike at his most vulnerable spots. In the current run of Detective Comics, someone is doing the same. Many of the people who have contributed to making Batman who he is have been targeted. This issue, the victim-to-be is Thaddeus Brown, the man behind Batman’s skill at escape. Apparently he also trained Scott Free (though I always thought that came from his life on Apokalyps). Together, they must free themselves from a tank rapidly filling with water. However, drowning is no their only peril. There’s also man-eating sharks on the prowl for their next meal. It’s hardly a spoiler that they escape, and Batman continues following the clues to the next suspect on the list. For those that enjoy Batman as your all-purpose crime fighter, this storyline is for you. He is a detective, and escape artist, a brawler, and a partner when paired with the right teammate. He’s gone up against street criminals, super villains, monsters, and everything in between. He is the multi-purpose, multi-dimensional super-hero, and it is perhaps that that makes him so popular among comic book fans. 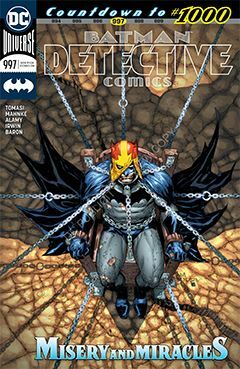 As the build-up to Detective Comics #1,000 continues, it is my hope that history will not repeat itself with a rehash of The Untold Legend of the Batman. Comics often repeat themselves, retelling old stories younger fans may be unfamiliar with. If it’s a fresh new spin, fine, I’ll be open-minded. Otherwise, let the Detective Comics #1,000 truly be the great story it deserves to be.